Although we have mentioned it before, we finally photographed our homemade concentricity gauge, made out of spare parts around the garage. It was relatively easy to make and our cost was less than $15 (about 1/3 the cost of the commercial gauge when it was widely sold, but is now hard to find). 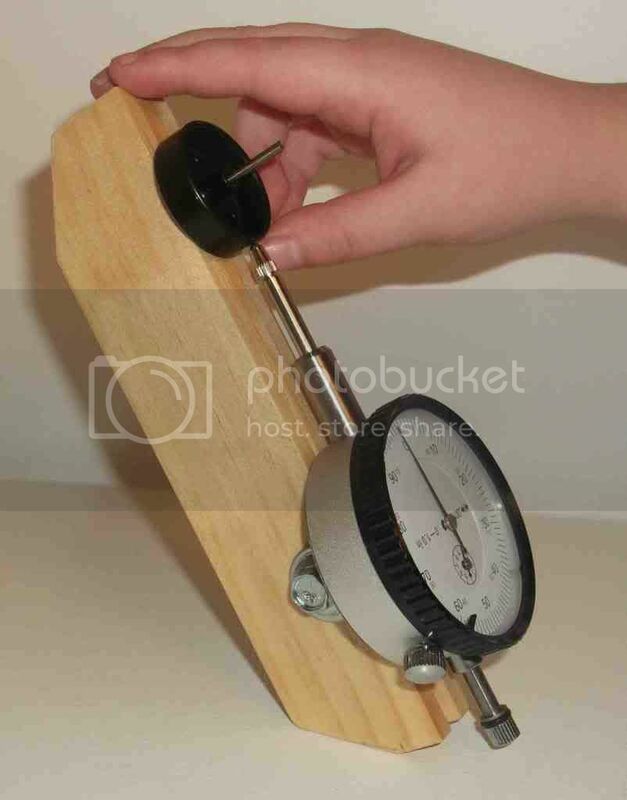 If you don't have a conventional set up to measure lateral run-out, you and your child can use this gauge to quickly and easily check for bad, out-of-round wheels. This is the same type of gage we used measure the runout of several populations of BSA wheels by mold number. 1. Cut the large paint stirrer into 3 pieces: 4-3/4" (x 1), 6-1/4" (x 2). 2. Clamp the two long pieces together. Drill (through both pieces) a 17/64" diameter hole located 11/32" from the long edge and 1" from the short end (see photo). The short edge closest to the holes will be the top edge of the tool. The holes will secure the dial indicator through its lug back. 3. Spread a very thin layer of wood glue on both sides of the short piece and sandwich it between the two drilled pieces, keeping the bottom edges and long edges aligned. Slide the shank end of the 17/64" bit through the drilled holes to keep the longer pieces aligned. Tightly clamp the sandwiched pieces together, make sure the long and bottom edges are flat and square against a flat (preferably machined) surface. Wipe away any excess glue. Allow the glue to dry before removing the clamps. 4. 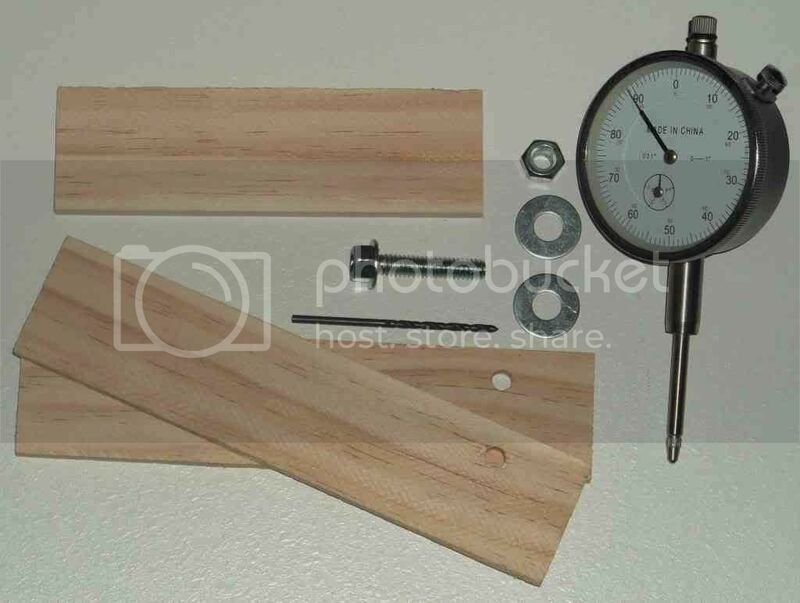 With the wood now secured, mount the dial indicator to the hole using the bolt, washers, and locknut. 7. Sand all edges flat. Insert a 3/32" drill bit into the hole, deep enough to cover the fluting. Optional: Trim off excess wood behind the dial at a diagonal and trim up the bottom edge. Here it is in action. Although a 3/32" bit sounds a bit loose, we like the fact that the wheel spins freely and comes on and off easily, and the slight pressure of the indicator arm hold the wheel sufficiently against the bit such that we’ve never felt the need to upgrade to a larger diameter pin gauge. When turning the wheel, applying pressure from the top (as in the photo) minimizes play in the readings. Another "upgrade" barely visible in the photo was the addition of some very thin plastic as a backing for where the wheel rides on the wood (cut from a piece of blister-pack packaging about to go into the garbage). This was not really necessary though. Last edited by FatSebastian on Wed Mar 07, 2012 9:04 am, edited 3 times in total. The only thing I would be concerned about. Is not using different size pin gages to match the different size wheel bores. I only say this, is I do see different readings if I do not use a pin gage matching the size of the bore. I would get false readings, claim the run out was better than it actually was. I also prefer the flat tip for the end of the dial indicator. It jsut give a bit wider of surface contact and less marks on the wheels ! But this is great and I hope it helps people to build one, who are really into improving and understanding what it all means ! Thanks for the feedback Sporty! 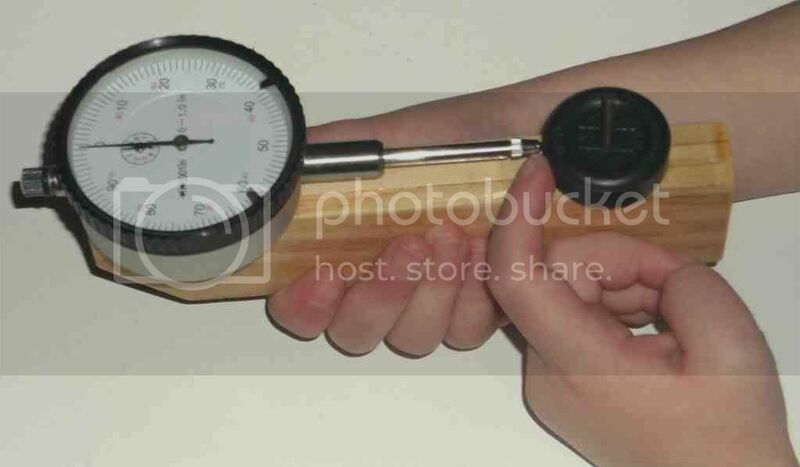 sporty wrote: I do see different readings if I do not use a pin gage matching the size of the bore. I suppose this would be a shortcoming of the commercial version too. Because it is easy and cheap to make, perhaps you might be in a position to someday make one and see how the errors compare to a more conventional set-up. The pin cannot be too tight, because the pin cannot rotate like it might if resting in V-blocks. The dial indicator does not move off axis (left or right relative to the wheel face), and the pin does not move either. The readings therefore seem reproducible (to within 0.001") with just a little practice. sporty wrote: I also prefer the flat tip for the end of the dial indicator. It just give a bit wider of surface contact and less marks on the wheels ! Good point. We have yet to notice the rounded tip leaving marks, but it is something for which to look out. How much pressure is applied to the tread is a function of how closely one sets the pin to the dial indicator. In the photographed unit, the pin was located so that the indicator arm is compressed only about ~1/100". This results in very little tip pressure on the tread relative to what the tread will experience in racing conditions. I agree that there are lots of small improvements that could be done to something like this. We have a flat tip for the indicator. Pin gauges could replace the drill bit (we have a full complement of 0.0005-graduated pin gauges in this range). The end of the pin could be rounded and polished to minimize risk of scratching the bore. If using a drill-bit with markings stamped on the shank, one could run to the hardware store and look for a premium bit that is plated and unstamped, or at least rotate the marks down and away from the indicator arm. One might even operate the whole thing upside down, locating the pin so the dial tends to zero on the 6 o'clock position instead. Etc. But our goal was to have something cheap, uncomplicated for us to describe, simple to use, and fairly easy to make from ordinary components from the hardware store (well, excepting the dial indicator perhaps). We think this tool would be useful for identifying the best wheels to use out of a new lot, or trying to discover which of the four wheels in the box should become the raised wheel. Wait until the dial indicator goes on sale, and then use a 20%-off HF coupon on top of that, and you can make a relative inexpensive handheld tool that you would not be afraid to let a child use. That Homemade Concentricity Gauge is a clever idea. You could make the wooden part longer and drill different size holes for your pens. And have the Dial Indicator move down for different setting as well. And the kids could rest the longer end of it on there chest to help hold it. Then with there free hand spin the wheel and take the readings. Just and idea to look at! whodathunkit wrote: You could make the wooden part longer and drill different size holes for your pins. I like the way you think Whoda! I should probably note that the recommended dimensions of the 3 sandwich pieces of wood make for the longest possible unit out of a single paint stirrer. Using more than one stirrer should be no big deal, except in our experience we have found that different stirrers can have slightly different dimensions (they are, after all, disposable pieces of wood). So if one goes for a longer tool, one would like to use stirrers which match in width (approximately 1-7/16") or else some extra effort must be spend aligning, sanding, and trimming stirrers of differing widths. However, your comment about being able to partially rest the tool gives me the idea of turning the tool over so it can rest on a countertop if needed. Some might find that to be a significant improvement in usability (especially in a group environment), without further complicating the tool or adding to its expense. The one in the photograph will already "stand on its head" when rested on the diagonal cut behind the dial indicator; I may try to throw one together that intends to works upside-down (dial points in the 6 o'clock position with the wheel installed). Thanks! I've been wondering about this since I read a thread a couple months ago answering the question "What new tool do I need?". Several people chimed in "dial indicator" and I was left . Is there a reason for using paint stirrer planks instead of a single chunk of 2x4, for example? Last edited by macd on Thu Mar 01, 2012 3:49 pm, edited 1 time in total. macd wrote: Is there a reason for using a paint stirrer planks...? Mostly ease of fabrication. The thickness of the stirrer is 1/4", the same as the thickness of the dial-indicator's lug. So offsetting and sandwiching the shorter piece of 1/4"-wide wood creates a snug notch into which the lug can fit; IMO this required less effort and skill than trying to carve out a notch from a solid block of wood. Also, it is no great loss should one mess up during fabrication as no great craftsmanship or woodworking skill is being invested in what is otherwise a disposable piece of wood. that the indicator arm is compressed only about ~1/100". This results in very little tip pressure on the tread relative to what the tread will experience in racing conditions. When My friends who own there own machine shop showed me and taught me. Is to get a accurate reading, the spring in the dial indicator does need to have decent tension. I believe this may also be mentioned in the isntructions, when you get a dial indicator. So at a min, I always alteast have 25% of the dial indicator compressed. But I think its actually suppose to around 40% to 50% compression. Maybe another machinist can chime in here. I have a concentricity gauge by derbytek tools that I got off of Maximum Velocity a while back. It didn't occur to me until I saw this post that I might have been getting false readings due to the pin and different size wheel bores. Thank you for starting this topic and showing us what you made. yes it was nice for FS to show his custom one and how to make it. And I just happened to see what I have ran into and Added in caution of that can happen, if you do not not use pin gages that match the wheel bore and the proper pressure from the tool. sporty wrote: to get a accurate reading, the spring in the dial indicator does need to have decent tension. Thanks for pointing out this possibility. Certainly it would be safer to maintain more plunger compression if there is any doubt as to the relative accuracy of the dial indicator versus the depth of compression. Of course it is very easy to get added compression by drilling the pin hole 1/4" to 1/2" closer to the dial (and we have made others assemblies with increased compression). If one does this, then it is probably useful to shorten the short piece of wood by 1/2" (4.5") and drill the 17/64" holes 1/2" further from the top edge (1.5"). sporty wrote: I believe this may also be mentioned in the instructions, when you get a dial indicator. I pulled out two boxes for dial indicators of differing brands; both included a certificate or warranty statement but no instructions to speak of. whodathunkit wrote: It didn't occur to me until I saw this post that I might have been getting false readings due to the pin and different size wheel bores. FWIW, this kind of single-pin arrangement seems good enough for the Derby Worx Pro-Wheel Shaver? I think it really depends on one's expectations and how one plans to use something like this. For example, I would hesitate to claim a set of professionally machined racing wheels were flawed just because they didn't indicate zero runout a homemade concentricity gauge made from wood scraps. Yet a child should be able to clearly identify his best wheels out of the box or determine which wheel mold numbers should be avoided. The little bit that I do know about mechanical dial indicators is that the precision of their graduations tends to be set at the accuracy limit. That is, if the dial is graduated to 0.001" then the accuracy is supposed to be that level too. Therefore, given an otherwise perfect shop set up, I'm not sure if one should ever expect better than ~0.001" accuracy with a $12 dial indicator. I suppose figuring out the possible errors gives us one more excuse to assemble a well-equipped home machine shop! In this inverted, upright version, we cut off the corner of the wood behind the dial indicator at a 30 degree angle so the unit can balance. Based on Sporty's comments, we played it safe and compressed the indicator plunger about 40% and also set the pin so that the indicator needle points at approximately the 6 o'clock position. We also changed some of the dimensions to accommodate the extended plunger travel when the unit is turned upside-down. Here are the updated instructions to make this version (notable changes are underlined). It also seems reasonable to employ a new #41 bit instead of the 3/32" bit to help maintain accuracy with "large"-bore wheels. Numbered drill bits are available from most well-stocked hardware stores. 1. Cut the large paint stirrer into 3 pieces: 4-1/4" (x 1), 6-1/2" (x 2). 2. Clamp the two long pieces together. Drill (through both pieces) a 17/64" diameter hole located 11/32" from the long edge and 1-3/4" from the short end (see photo). The short edge closest to the holes will be the bottom edge of the tool. The holes will secure the dial indicator through its lug back. 3. Spread a very thin layer of wood glue on both sides of the short piece and sandwich it between the two drilled pieces, keeping the top edges and long edges aligned. Slide the shank end of the 17/64" bit through the drilled holes to keep the longer pieces aligned. Tightly clamp the sandwiched pieces together, make sure the long and top edges are flat and square against a flat (preferably machined) surface. Wipe away any excess glue. Allow the glue to dry before removing the clamps. 7. Sand all edges flat. Insert a #41 drill bit into the hole, deep enough to cover the fluting. Trim off excess wood behind the dial at a 30-degree diagonal and trim up the top edge. Last edited by FatSebastian on Thu Jun 28, 2012 2:53 pm, edited 1 time in total. Pretty neat, FS. Thanks for sharing. I wanted to let you know, that you really should think about building one or getting one. Even if you guy your wheels. I will tell you why. I recently worked with some vendor wheels. I will not mention the vendor. A recently family stopped over for some help. I checked the wheels out, using a my run out gage for the wheels, I used my pin gages and my micrometer. I checked, O.D. bore size and run out. I was not pleased with what I found. two sets of wheels were checked. I can tell you, the sets had different bore sizes in them and some of the wheels had a run out of .004 ! I really can not suggestion to you enough to take the time to make one or get one. In the wrong run, its going to make sure you get what you pay for and help you understand the differances between a good wheel and a bad wheel.